Proudly serving Clearlake since 2007. To start service, please call us at 707-234-6400 or send us an email. We offer curbside garbage, recycling and green waste collection within the incorporated city limits of Clearlake, CA. As required by City of Clearlake ordinance No. 198-2017 residential property owner must subscribe to garbage service. Residential customers are billed quarterly. Carts need to be placed at curb or road edge at least 3 feet apart by 5:00am on your collection day. Please position carts to open towards the street and keep them free of neighboring or overhead obstacles. All material must fit inside cart and lid must close. Over-filled or contaminated carts may not be picked up and/or may result in extra charges. Material: Newspaper, household paper, magazines, cardboard, food and beverage glass, metal cans, plastic food and beverage containers. All recyclables are placed in the same cart. Carts need to be placed at curb or road edge at least 3 feet apart by 5:00am on your collection day. Please position carts to open towards the street and keep them free of neighboring or overhead obstacles. All material must fit inside cart and lid must close. Over-filled or contaminated carts may not be picked up and/or may result in extra charges. Residents can have one (1) bulky item collected twice per year at no charge. Bulky items typically include a piece of furniture or an appliance. A charge for freon removal may be applied for refrigerators, freezers and air conditioners. Prior arrangements must be made for this service. Collection of additional bulky items (beyond the two free collections) can be arranged for a fee. Arrange your bulky item pickup by calling us at 707-234-6400. Want to know what’s eligible for free bulky item pickup? 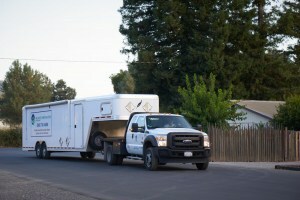 We offer onsite garbage, recycling and organics waste collection within the incorporated city limits of Clearlake, CA. Commercial customers are billed monthly. At CWS, we are committed to being your local recycling resource. An on-site assessment of your waste stream can identify ways to capture more recycling which may result in a reduction of your garbage bill. Please call us at 707-234-6400 to schedule a free on-site visit. For those temporary special projects or large jobs, CWS provides the right bin at the right price for the right material. Weight restrictions are enforced and a Signed Agreement is required. Please call us at 707-234-6400 or contact us for more information. When disposed of in the trash or down the drain, household hazardous waste threatens to damage the environment and may end up in Clear Lake or other waterways. Household Hazardous Waste includes pesticides, paints, solvents, thinners, batteries, medical waste or material containing asbestos. Through our HAZ-DROP program, household hazardous waste is collected from Lake County residents the third Friday and Saturday of each month from 9:00 a.m. to 1:00 p.m. at rotating ends of the lake for convenience to all residents in Lake County. See below for accepted materials. Most items are accepted free of charge (see below for accepted materials). Businesses must make an appointment by calling 707-234-6400 and a small fee will apply. Dates, locations, and times for HAZ-DROP can be found here. Televisions and computer monitors are accepted at no charge at these locations. For information on the proper disposal of hazardous waste, please contact the Lake County Hotline at (707) 263-1980. CWS is committed to educating residents and providing value tips regarding garbage, recycling and composting. We are especially proud to work with Concerned Citizens 4 Clearlake, an all-volunteer group of residents focused on cleaning up illegal dumpsites and litter in and around the City of Clearlake. We are available to make presentations to civic organizations and group who would like to learn more about preserving our natural resources and leading edge solutions in managing solid waste. Call us at 707-234-6400 to schedule your presentation. Teaching our children to reduce, reuse and recycle now protects our environment’s future. Free presentations are available to schools and groups ranging from kindergarten to 12th grade. Presentations last approximately 45 minutes, and focus on litter, the 3 R’s (reduce, reuse & recycle) and proper disposal of household hazardous waste. Students will learn how they can help make their community cleaner and more sustainable. Call us at 707-234-6400 to schedule your presentation. Want to catch up on all of our Clearlake news?